Submitting an oil sample and the corresponding information is easy but must be done with attention to detail. 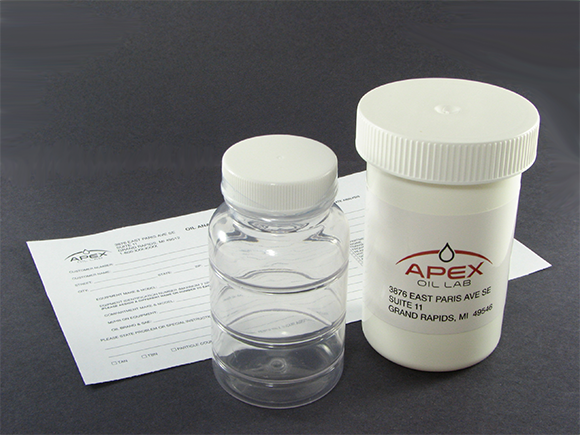 The oil sample must be drawn to collect the most representative sample, while minimizing contamination. Based on the asset, there are different ways to draw an oil sample. 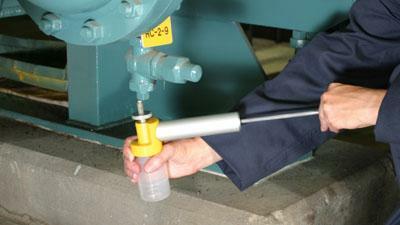 Each oil sample must be accompanied by an oil analysis form. This provides the asset’s and fluid’s information, so that proper testing and diagnosis can be performed. Oil samples need to be sent immediately to keep results as relevant as possible. Correct systematic oil sampling is vital to obtaining representative oil samples that will assist in accurately depicting the condition of the oil and equipment. Consistency and cleanliness are key to accurate results and reliable trending history. 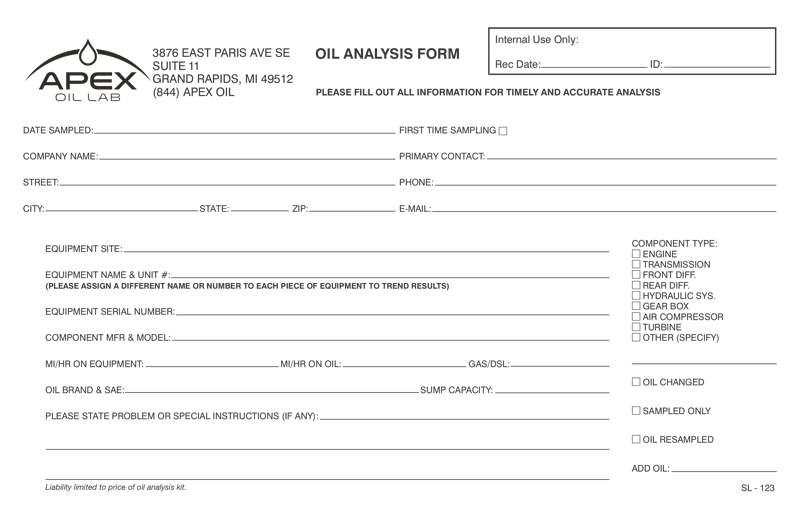 Each oil analysis kit includes an oil analysis form. Accurate, detailed information on your lubricant and equipment will assist in a more relevant and in-depth analysis. Particularly important for clients with multiple assets of the same type, precise equipment identification (EIN or S/N) eliminates confusion on which piece of equipment is being tested. Customer contact information must be completed so we can contact you with any concerns, questions, or alerts. Reports are in pdf format and normally sent via email. The more detailed information you provide about the oil and equipment, the more in-depth diagnosis we can provide. Send the white copy with the oil sample. Customers can retain the yellow copy for their records. Keep results relevant. For oil analysis to be effective, the entire process must be done in a timely manner. While oil analysis is an excellent early detection tool, it can also detect an impending failure. Oil samples should be sent immediately after they are drawn. With our same day/24 hour service, results will be available quickly and in time for corrective actions to be taken. Maintain the quality of the oil sample. While an oil sample sits in the bottle, the fluid will start to change and degrade. If the oil sample sits too long prior to arrival at our lab, the sample will no longer provide an accurate representation of its condition or the condition of the asset at the time of sampling. Use the shipping method that works best for you. Each oil sample kit includes a plastic shipping envelope which can be delivered to our lab via the carrier of your choice. Customers sending multiple oil samples are encouraged to ship them in a single box to ensure that all the samples arrive together. 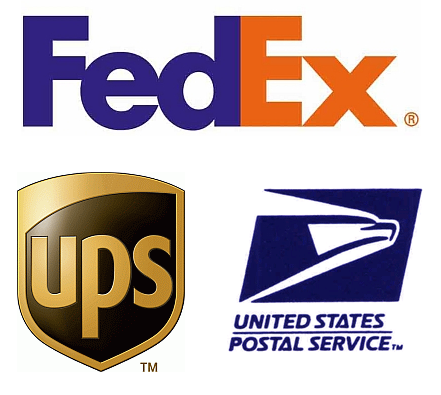 We also suggest a tracking number to follow the status of your shipment.